Google's Android Developers page reveals that Android 4.0 hasn't captured a lot of marketshare since it was launched six months ago. Just 7.1 percent of all Android devices run the latest versions of the platform, while roughly 70 percent of Android smartphones and tablets still run Android 2.3.x. Further details at Neowin. According to information on the Android Developers page, Android 4.0 is installed in just 7.1 percent of all Android devices that have the Google Play download store installed. That compares to a whopping 70 percent of smartphones and tablets that have some version of Android 2.3 (also known as Gingerbread) inside. 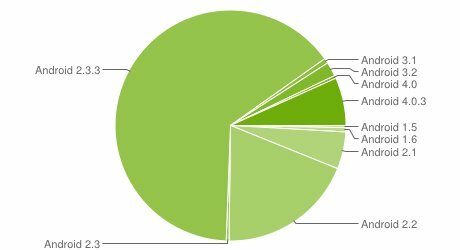 Even the older Android 2.2 (Froyo) still holds on to a 19.1 percent market share of all Android devices. To be fair, Android 4.0 is doing better than the tablet-only Android 3.0, which is only installed in 2.7 percent of all Android devices. Also, Android 4.0's percentage has doubled since April as more and more older devices get upgrades.